The Settings screen provides some global display settings for labels and formats of the tournament tables [mstw_bb_table] and brackets [mstw_bb_bracket]. These settings apply to all shortcodes. Settings for individual tables and brackets can be set using shortcode arguments. Team Name Format: Team names may be displayed as Name, Mascot, Name & Mascot, Short Name, or Hidden (should you only wish to display team logos). The default is Name. Show Logo: Team logos are shown by default. They may be hidden with this checkbox. Show Seed: Seeds are hidden by default. They may be shown before or after the team name. Home Team Indicator: Home teams may be indicated by a character – *, †, and ‡. This list may also be extended via the mstw_bb_home_formats filter. Being the home team may matter a lot, say for baseball, or may just indicate who wears white uniforms, or not matter at all. By default, no home team indicator is shown. Location Format: Location names may be displayed as Stadium Name, City, Stadium (City), or Stadium (City, State). The default is Stadium Name. Location Link: Location names are not linked by default. They may be linked to the Venue URL or a Google Map showing their location. Date Format: The date format may be chosen from the dropdown menu. Many common formats are available, but just in case, this menu may be extended via the mstw_bb_date_formats filter. Custom Date Format: This setting may be available in a future release. Time Format: The time format may be chosen from the dropdown menu. Many common formats are available, but just in case, this menu may be extended via the mstw_bb_time_formats filter. Custom Time Format: This setting may be available in a future release. TBA Format: The TBA format defaults to TBA. It may also be set to T.B.A., TBD, or T.B.D. These strings may be “translated” via the standard WordPress Internationalization capability. The list may also be extended via the mstw_bb_tba_formats filter. Game Label: This label is used to reference future games. The default is “Game”; for example, “Game 7 Winner”. It can be used for translation/localization. Note that this label is only used by tournament brackets, not tables. 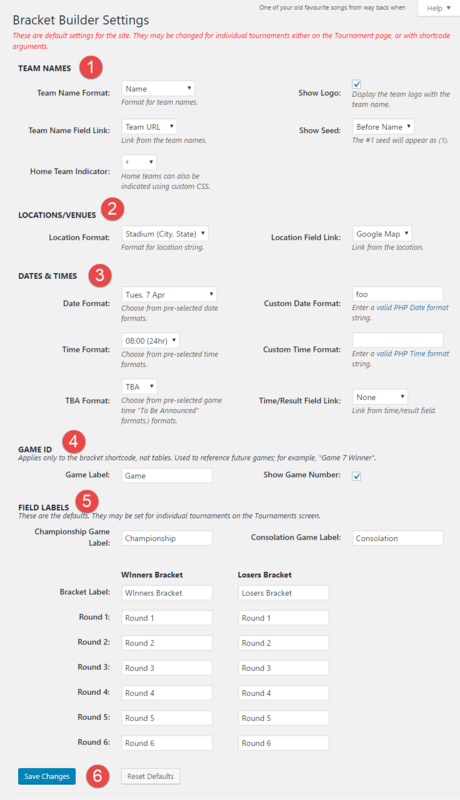 Show Game Number: Game numbers are shown in both tournament brackets and tables by default. They may be hidden with this checkbox. The Championship Game: The default is Championship. The Consolation Game: The default is Consolation. The Winners Bracket: The default is none (the empty string). The Winners Bracket Rounds: The defaults are Round 1, Round 2, Round 3, Round 4, Round 5, and Round 6. These strings may be “translated” via the standard WordPress Internationalization capability. The Losers Bracket Rounds: The defaults are Round 1, Round 2, Round 3, Round 4, Round 5, and Round 6. These strings may be “translated” via the standard WordPress Internationalization capability. Save/Reset. Click the Save Changes button before exiting the screen to save any changes. The Reset Defaults button is not functional is version 1.0. The default settings are described above and in the Shortcode Arguments man page.